Heavy duty contactor assembly specifically designed for rigorous use, will handle 50 amp power cord and up to 12kw generator. The ES50M-65N is intended for use as an electrical transfer switch to automatically switch multiple sources (from one to another), i.e. switching from shoreline to generator power. It is primarily designed for installation in conjunction with a generator having a rated output no larger than 12KW and an external power cord having a rated output no larger than 2 pole, 240VAC, 50A, 1PH, 60HZ. PHYSICAL SIZE: 8 1/2" x 8 1/2" x 4 1/2"
Install vertically or horizontally in a dry, accessible area. Consult factory before drilling metal case. Keep covered except during wiring as contactors are sensitive to dust and debris. When hi-potting coach, disconnect es50m-65n or hi-pot on load side of switch. This unit has been hi-potted to UL standards at the factory. Automatically switches from power cord to generator. Transfers both hot and neutral legs simultaneously. 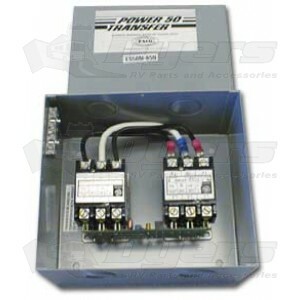 Economical and reliable time delay switches automatically from shoreline to generator power. Capable of monitoring for low generator voltage. Built-in time delay allows generator to get up to speed. Designed for oem and aftermarket applications.